I’m pretty much up for trying most foods unless they involve mushrooms. I know, I know. I hear all the time how positively uncivilized I am because I dislike them. And – trust me – I’ve tried to like them. But… I just don’t. So when my husband and I were in Atlanta a few months ago, and I had a whole day almost all to myself, I browsed quaint little stores and galleries, took in a movie, and ate interesting things in interesting restaurants. Poor sweetie, he had to attend a conference and breathe stuffy air, listen to Muzak, and eat the mandatory carb-laden menu. I, however, was able to seek out the stores and restaurants frequented by the locals and not the tourists. As it happened, we were in Midtown, close to Piedmont Park and some really wonderful shops and eateries. One I couldn’t help but notice was The Flying Biscuit. With a name like that, the open windows, reggae music floating toward the sidewalk, and the smell of homemade biscuits, I knew that The Flying Biscuit would provide my dinner that night. They had all manner of tasty and unique items, but I am naturally a salad girl. I like fried food and steaks and casseroles and things like that on the very rare occasion, but show me a unique spin on salad, and I’m so there. When I saw Fried Egg Salad on the menu, I knew it was for me. People I’ve told about it had trouble disguising their “ewww” factor when I told mentioned a salad that came with fried eggs, but gosh darn, it was actually quite amazing. As I ate it, I knew I would have to try to recreate it at home. Once home, Googling “fried egg salad” didn’t yield a thing, so I looked at the menu online and went from there. The menu describes the salad as: Two farm fresh eggs over medium, oven-roasted rosemary potatoes, and crisp turkey bacon on a bed of field greens tossed with balsamic vinaigrette and drizzled with spicy chipotle aioli. While I can’t say that it tastes exactly like the real deal, it’s close enough that I don’t have to get in the car and drive for hours just to get my fix. I think the concept of a semi-runny egg flowing out over lettuce might put some people off, but really, it’s not uncommon to see eggs in a salad. Um, egg salad anyone? No, really, think Cobb salad or Chef salad, which both use chopped hardboiled eggs as an ingredient. 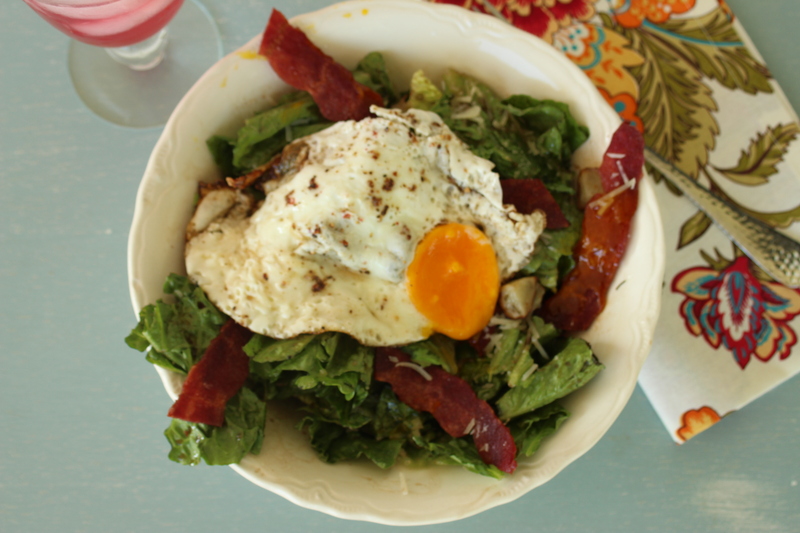 Or… Caesar salad, made properly and from scratch uses raw egg in the dressing. So it’s not a long leap to add fried eggs now, is it? 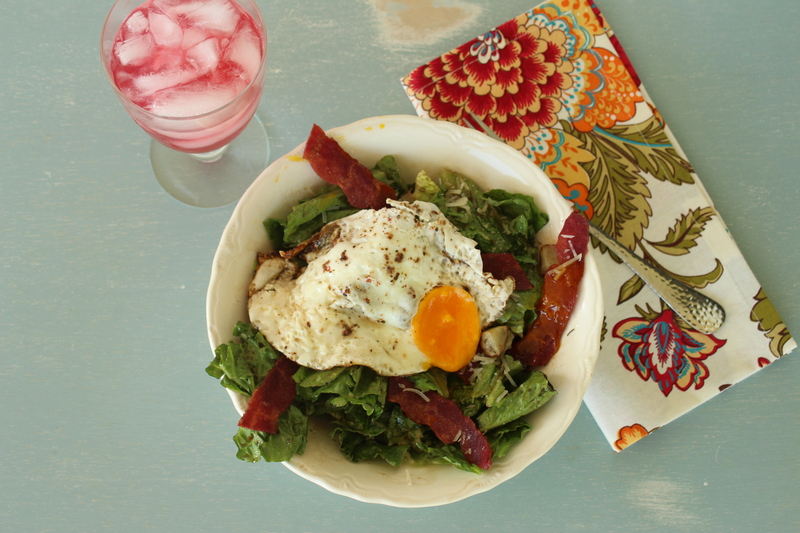 The runny egg yolk sort of acts as an emulsifier with the rest of the dressing, and the salad as a whole has a very creamy, yet fresh mouthfeel. One of those words I’ve picked up from watching Food Network or Cooking Channel cooking competition shows…. Judges use words and phrases like… mouthfeel. Amuse bouche. Umami. Flavor note. Graininess. Each of them is something I now know only because of TV. Julia Child may have introduced Americans to souffles or Coq au Vin, but a whole new lexicon has opened up because of Food TV. 16 year olds know what these mean, and I had to wait until I was in my 40’s to learn these terms. Darn TV. Now I can’t enjoy my food, I have to understand it too! Place all ingredients in a food processor, or use an immersion blender to blend until smooth. Place into a small zip-top baggy and refrigerate until ready to use. Preheat oven to 350 degrees. Wash and dice potatoes into 1/2″ cubes, skin on. Dice small onion. Place both in an oven-proof dish. Chop rosemary and thyme. Toss together with the olive oil, salt and pepper. Cook for approximately 50 minutes, stirring occasionally, until the potatoes are golden and tender. Set aside. Beat the vinegar in a bowl with the syrup/honey, garlic powder, onion salt and pepper. Slowly pour in olive oil, whisking constantly. Use the same skillet to fry the eggs. Add a bit of butter if necessary. Eggs should be cooked to “over easy”, which means that the white is fully cooked, and the yolk is slightly runny. Check out Alton Brown’s recipe and technique for cooking eggs “over easy.” Having the egg yolk slightly runny enhances the vinaigrette; it sort of emulsifies and makes the dressing very creamy. Assemble the lettuce into 4 bowls. Divide the potatoes between the bowls. Toss with balsamic vinaigrette. Top each bowl with a couple strips of bacon, and two just-fried eggs. Cut off a bit of one corner of the zip-top baggy, and generously drizzle the chipotle aioli over the eggs. Serve with some homemade biscuits and strawberry jam!